Benzoyl peroxide is the world’s best-known over-the-counter (and sometimes prescription) product for acne. There’s no doubt that benzoyl peroxide can help clear up infected pimples. But benzoyl peroxide for baby acne requires special handling. When using Benzoyl Peroxide to treat baby acne, always choose the lowest strength possible to protect your baby’s delicate skin. Benzoyl peroxide breaks down into two different chemicals when it is applied to the skin. One of these chemicals is a substance called benzoin. This chemical is found in cranberries, bilberries, and apples. It protects plants from fungal infections. In humans, it slows down the rate at which bacteria can reproduce and it’s also a mild pain reliever for infections in the skin (assuming it’s used in concentrations that don’t cause inflammation or irritation of the skin). The other chemical that is released when benzoyl peroxide is applied to the skin is oxygen. Of course, the surface of the skin is exposed to oxygen in the atmosphere at all times, but atmospheric oxygen usually does not find its way into the base of skin pores. While acne bacteria, unlike some other species of bacteria, can withstand limited exposure to oxygen, too much oxygen on the surface of acne bacteria causes inflammation analogous to the inflammation generated by acne bacteria on the skin. Benzoyl peroxide kills acne bacteria fast, although not instantly. Generally speaking, benzoyl peroxide creams kill acne bacteria more slowly than micronized (finely ground) benzoyl peroxide creams and both kill acne bacteria more slowly than benzoyl peroxide foams. Benzoyl peroxide face washes don’t do much good at all, because the benzoyl peroxide in them is washed away almost as quickly as it is put on the skin. It usually takes about 48 hours for benzoyl peroxide to kill 99% or more of the acne bacteria infecting a pimple. Getting rid of acne bacteria, however, is only the first half of the healing process. Redness and irritation don’t go away immediately because the inflammation of acne is actually the immune system’s reaction to acne bacteria, not something caused by acne bacteria themselves. (There are other kinds of skin infections, such as most streptococcal infections, that generate their own inflammatory toxins.) Only when the immune system finally stops sending out chemicals to kill the bacteria that are no longer there will pimples begin to fade away. This second half of the healing process usually takes about a week on young skin and about two weeks on adult skin. Benzoyl peroxide is of very limited value for treating whiteheads and blackheads. And a baby’s skin grows so rapidly that it opens clogged pores on its own. Pimples caused by baby acne, however, often will respond to acne treatment with benzoyl peroxide. The most important thing to do in choosing a benzoyl peroxide product for your baby is to choose the lowest strength available. The US Food and Drug Administration allows makers of acne skin care products to offer benzoyl peroxide in strengths of 2.5% to 10%. It’s imperative always to buy 2.5% (or, if you can find it, 2%) benzoyl peroxide for use in treating baby acne. The 10% strength of benzoyl peroxide is just too strong even for most adults. It’s OK when applied directly to a pimple, but this concentration of active ingredient almost always triggers itching, peeling, drying, flaking, and irritation of the skin. Both the 10% and a 5% concentration of benzoyl peroxide are available in both prescription and over-the-counter products. The 5% strength causes fewer problems than 10%, but it’s still hard on the skin even in adults. Nearly 80% of the people who start using a 5% benzoyl peroxide product don’t use the entire tube. Most people find that it causes unpleasant reactions that at the very least require cutting back on the use of the medication. A 2.5% strength of benzoyl peroxide is strong enough to kill acne bacteria but weak enough not enough to cause side effects. Most teens and most adults can use 2.5% benzoyl peroxide products to treat their entire faces. On babies, however, this strength of benzoyl peroxide should only be applied directly to an inflamed pimple. It’s not necessary to use any kind of acne care product on baby’s whiteheads and blackheads, because the baby’s skin is growing fast enough that they will literally fall out of the skin in a few weeks anyway. A dab of benzoyl peroxide on a baby’s pimple, however, will stop the infection so the skin’s natural healing processes can take over. 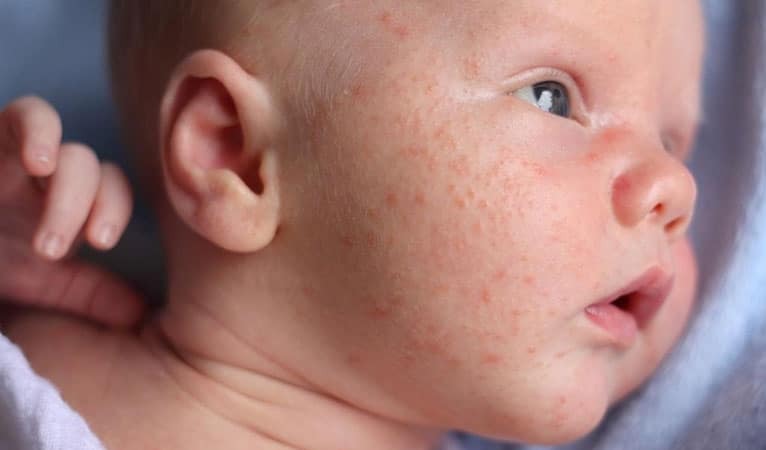 It may take two weeks for an adult’s skin to heal completely after benzoyl peroxide treatment and about a week for a teenager, but sometimes a single dot of benzoyl peroxide on a baby’s pimple will result in complete healing in just 2 or 3 days. If you don’t want to spend a lot of time reading product labels but you want be sure you buy a product that is safe for treating a pimple on baby’s skin, here are some suggestions. Neutrogena On the Spot Acne Treatment is the least expensive benzoyl peroxide product on the market, and for treating baby acne, it’s also the best. The clay in Neutrogena On the Spot Acne Treatment holds the benzoyl peroxide to the skin, but also locks moisture in the skin so baby’s skin does not dry out. Don’t use this product all over baby’s skin. Try a single dot of the product on a single pimple,wait a day, and make sure there are no adverse effects. Then treat up to three pimples at a time, each with a tiny dot of the product, discontinuing the product if the baby shows any redness or irritation not there before treatment. Paula’s Choice CLEAR Acne Fighting Treatment with 2.5% Benzoyl Peroxide is also a formula that is safe for baby’s skin. The 2.25 ounce container, which retails in the United States for $16.95, is more than enough than would ever be needed for treating baby acne. Proactiv Solution Renewing Cleanser won’t work on baby’s pimples. It’s rinsed away as soon as it is applied to the skin (if it is used according to label instructions), and it can cause eye irritation. Skin Medica Acne Cleanser has the right strength of benzoyl peroxide, and the witch hazel added to the formula gives it a nice aroma. The white willow bark in the product will get the red out of pimples right away and also relieve itching and irritation. But at $50 for 2 ounces (30 ml), it’s not the first product most cash-strapped parents are likely to try. What Is Your Personal Best Acne Solution?